Keeping Our Nose To The Grind Stone! 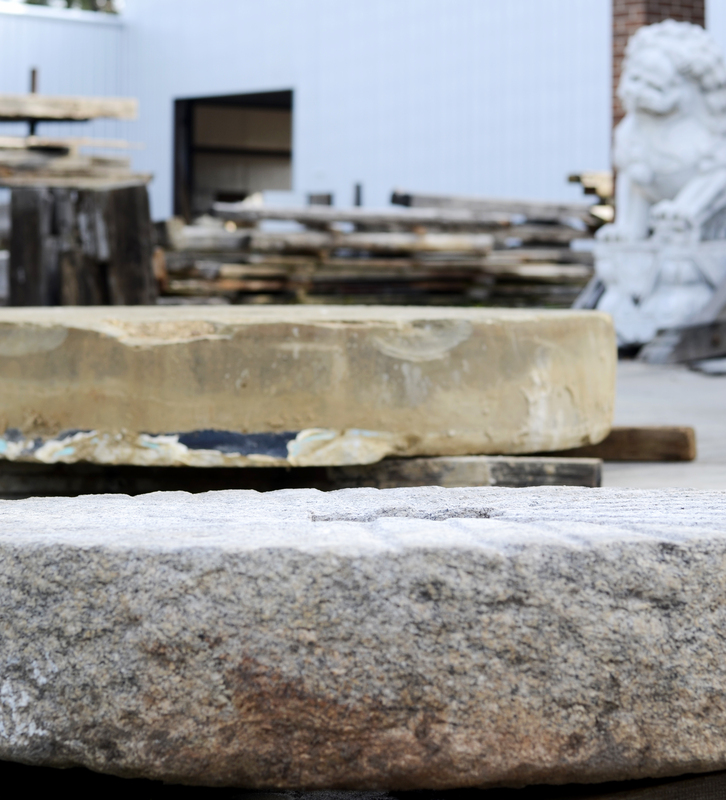 At first glance these salvaged mill grist stones might pale in comparison to some of our more ornate architectural finds but not so! Millstones are a symbol of harvest and hospitality and date as far back as the dawn of man. The millstone is also referenced numerous times in the Bible. Samson, for example, after having been captured by the Philistines, was bound with bronze chains at the helm of a millstone and made to grind grain in their prison. The first economies in America were built around grist mills. Access to a millstone and grain were life sustaining resources for many cultures throughout history. 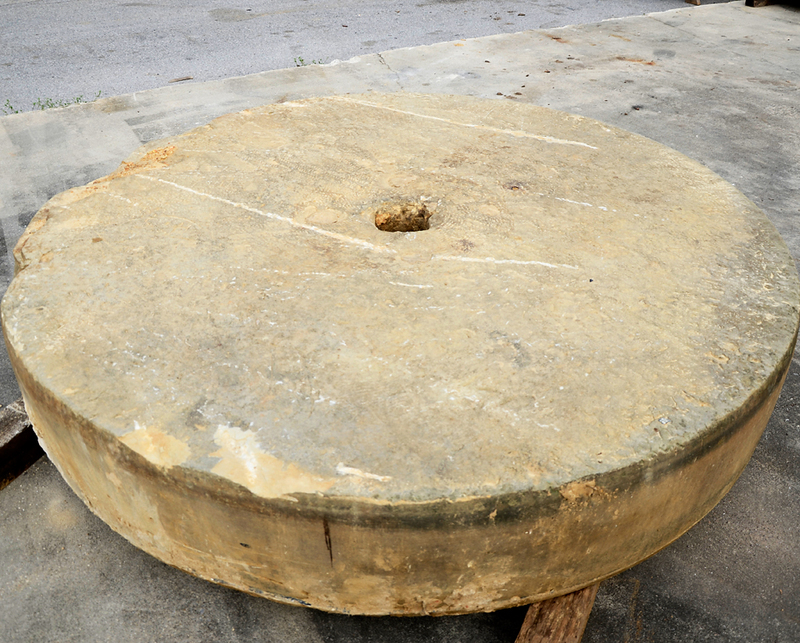 This European millstone is 6 1/2 feet in diameter and 13 inches thick. 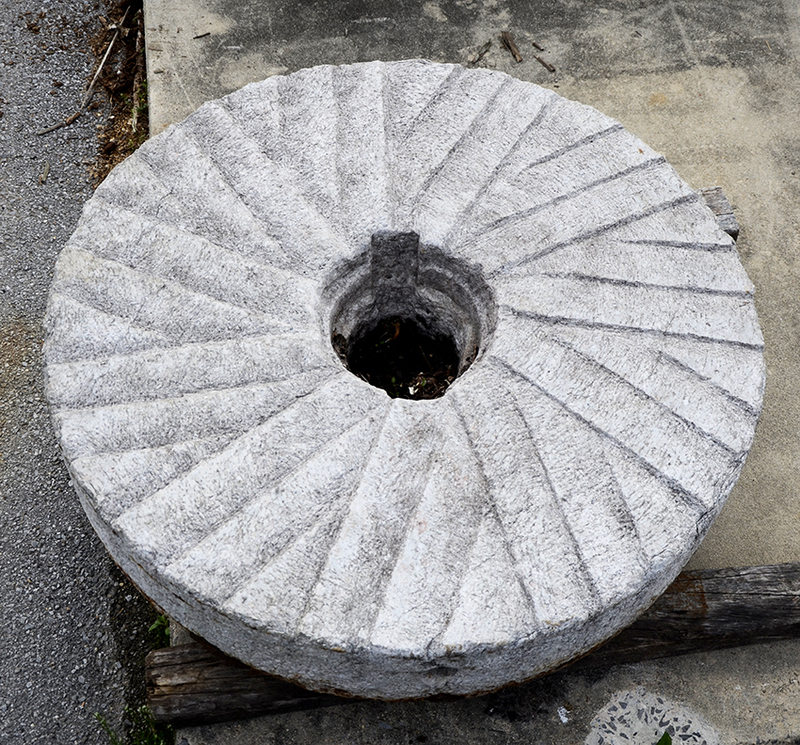 Millstones typically came in pairs and are cut from burrstone or limestone. The base or bed stone was larger and normally set in concrete or mortar to keep it stationary. The top or runner stone was a bit smaller and contained a handle. Grooves were hand cut into the face of the stones, the design of which ranged from subtle to elaborate. Grain was fed through a hole in the top of the runner stone. As this stone was rotated back and forth the groves cut through the grains of wheat, much like scissors, eventually grinding them to a fine flour. Smaller stones were used in homes and required two people to rotate the runner stone. Larger stones, available for community or commercial use, required considerable man power or quite often livestock to operate. Although access to flour for baking bread was vital, the act of grinding the grain was considered a menial task. Millstones were also used for grinding spices, nuts, and even pressing olives. The hand carved grooves on the face of this millstone are beautiful. Today, these millstones are a considered a prized possession. The variety of intricate hand carvings on the face are works of art. For many, the stones are collector items. They quickly become a unique conversation piece when used in garden and landscapes. Currently we have three unique stones that we recently acquired. We have a 42″, 48″ and a large 6.5′ in diameter European millstone. All three stones are on display at our wood warehouse. Stop by or visit us online to view more pictures and pricing information. 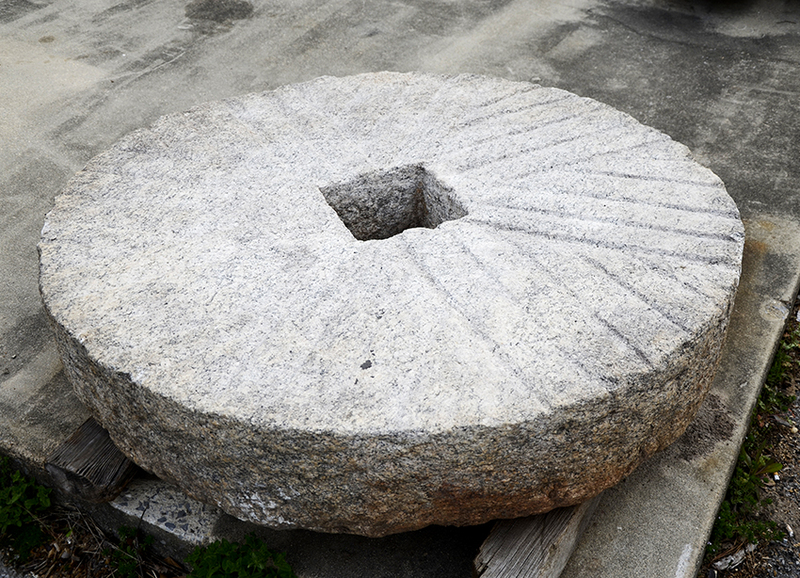 Each millstone is unique in size and face patterns. The millstones are located at our Wood Warehouse on Janeway Drive in Cullman, Alabama. 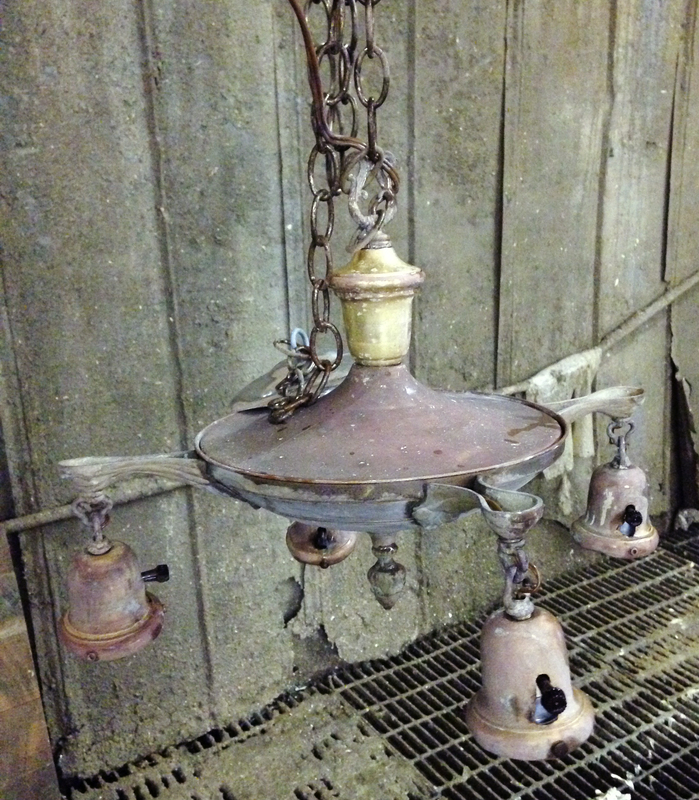 When thinking about salvaged lighting, most of our thoughts lean towards ornate crystal chandeliers. However, a large number of the lights that we salvage are pan lights. Pan lights were introduced in the early part of the 20th century and were made for electricity instead of gas. Although the architectural styles have evolved over the years from Victorian, Art Nouveau, Arts and Crafts, Prairie style, and most currently modern, the light has maintained it’s basic design. The pan light can be identified by the body of the light which typically has a finial attached to the bottom and one or more chains attached to the top. The body of the light fixture contains two or more arms which support the shade holders and shades. 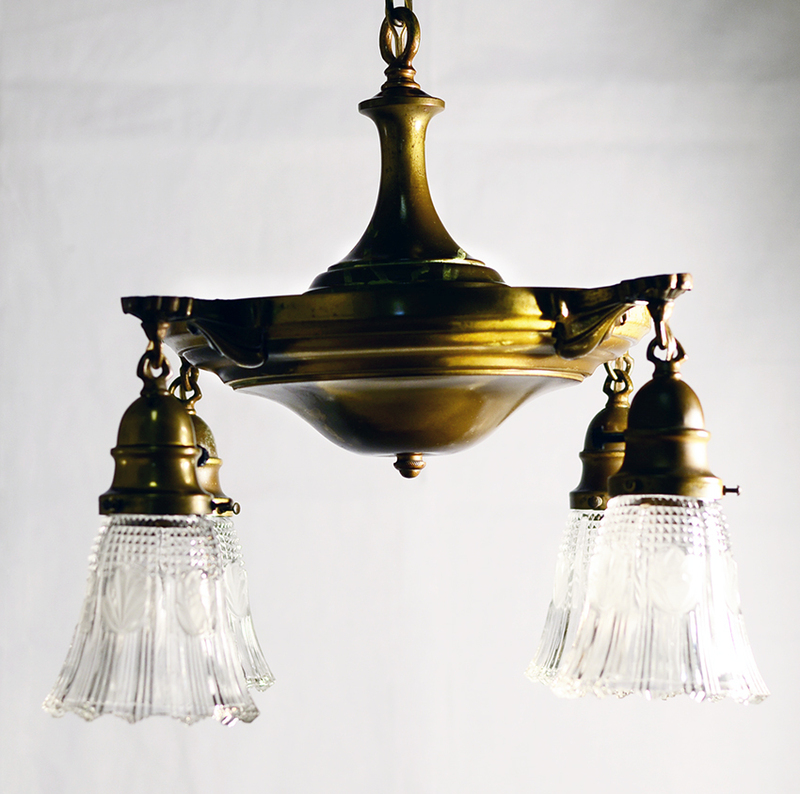 We’re always excited to find a pan light that still has it’s original glass shades! This salvaged pan light is covered with old paint. 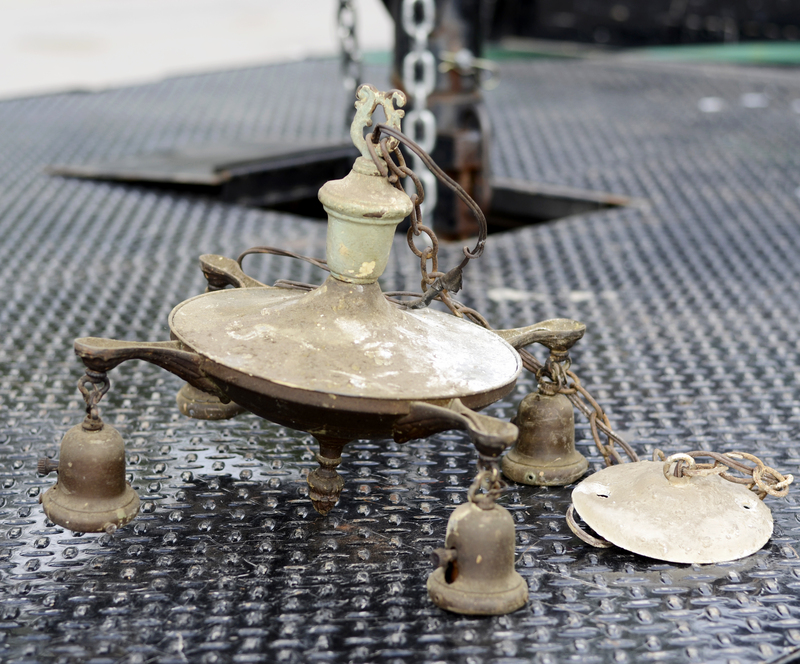 Most of the pan lights that we salvage are made of pressed brass, like the 4 arm light shown here that we rescued this week. This light was covered with several layers of paint. The light was taken to our wood shop where it was cleaned and stripped, removing all of the old paint, dirt and debris. The light will now be sent to our lighting technician, Tim, so that he can work his magic! Tim will rewire this light and give it a light polish. We love the natural patina of the aged brass so we do not try to bring the brass back to it’s original shine. Once the light has been fully restored it will be equipped with replacement shades and take its place in our showroom! The fixture has been stripped of the old paint and cleaned. It will be rewired and fully restored. Visit us on line or better yet, stop by our showroom and browse our incredible selection of salvaged and antique lighting! This pan light fixture has been cleaned, rewired, equipped with replacement glass shades and is ready for a new home! A couple of weeks ago we salvaged an upright piano from a structure in Birmingham. 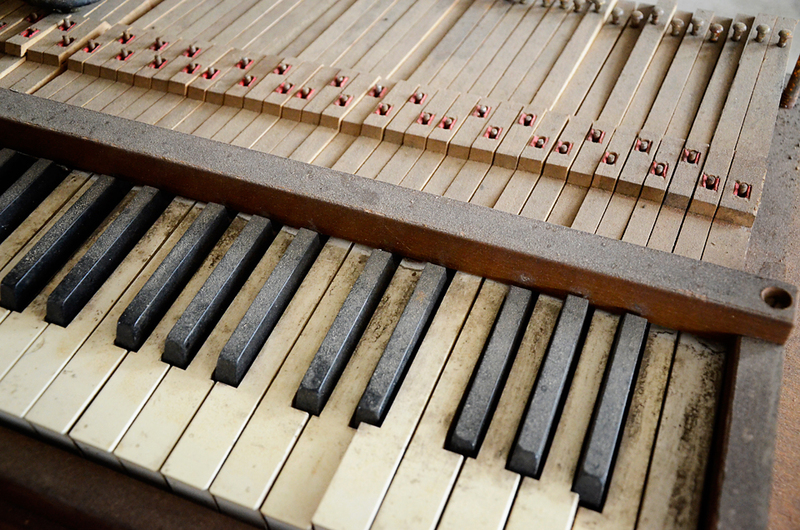 The piano was in such a state of disrepair, that it could have never been used to produce music again. 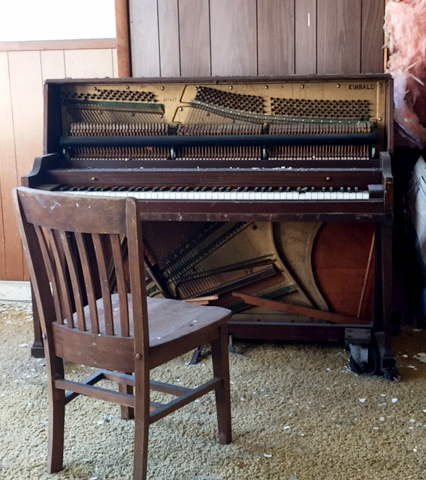 This once fine tuned piano seemed to have lost its luster in the dirty abandoned building. Our SA team has usually seen these discarded to the nearest landfill or even to the burn pile. 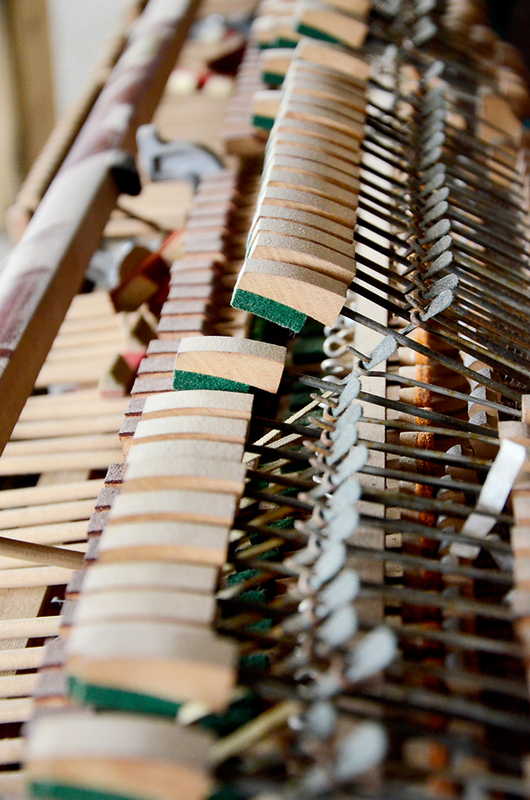 Most upright pianos are bulky, heavy and hard to move. But unlike most pianos, this particular one, for some reason, attracted our interest. Of course a few minutes later, it was being loaded and hauled back to Cullman. After we arrived back at the store, the instrument that was once carefully constructed by the hands of a skilled craftsman, was now being de-constructed by the hands of an artist. As we began this process, we started to see the beauty of the interior parts and patina of the individual pieces that was hidden inside. We saw the strings tightly pulled against the cast iron harp. We saw the wood wrapped velvet hammers that once created the soft tones of sound when they struck those strings. We imagined the small hands of a child sitting at the keys, carefully pecking out a simple melody. We will never know how many fingers ran across the keys during its lifespan or the amount of pure joy experienced by the many listening ears, but we can appreciate the history of the “pieces” that made up the “whole”. But now, it was our time to create a new history for the piano using our team’s imagination. Our future goal is to adapt these individual parts into a work of art that will be available for future generations to enjoy. 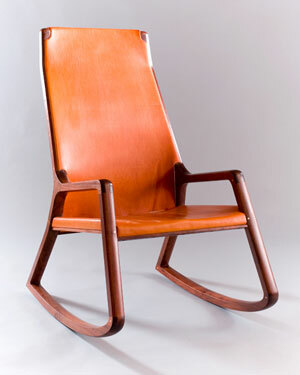 Continuing the story of its history by up-cycling its salvageable parts in the present, only allows for its continued appreciation in the future. Stay tuned for the big reveal as in coming weeks we give new life to a piece of this old piano by transforming it into a useful piece of building art! 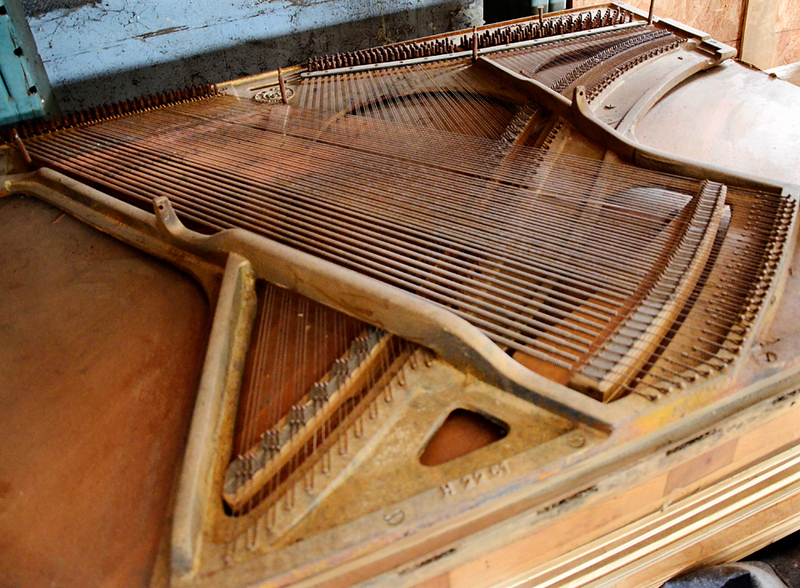 We would love to hear your ideas on how you would repurpose all of these piano parts. Visit our Facebook and Instagram page and share your ideas! Tag us with #saaa1969 and #SApianoart. 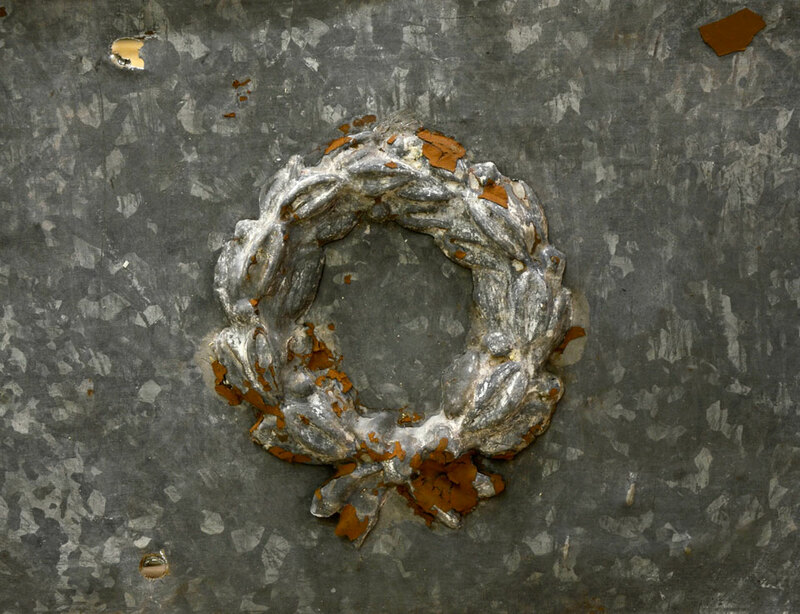 One of the things that we enjoy most about salvaging architectural elements is exploring ways to repurpose them. 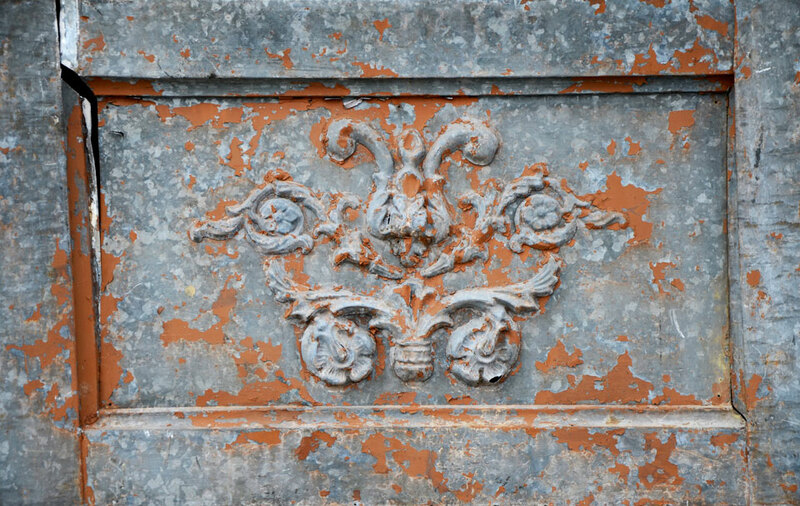 We brought back several large pieces of salvaged tin from our last trip to Philadelphia. 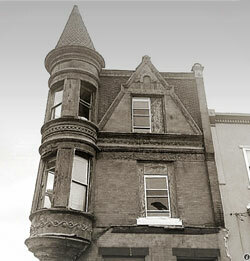 The tin, dated around the late 1880’s, was salvaged from the turret of a building similar to the one shown here. As soon as we saw these pieces, we immediately knew we wanted to use the tin in a way that would showcase each magnificent piece. SA team member Josh Howe turned several pieces of the tin into gorgeous wall art by framing them with salvaged pieces of door and window trim from another salvaged structure. Whether framed or used in other creative ways, the beauty of this tin is deserving of a second life! 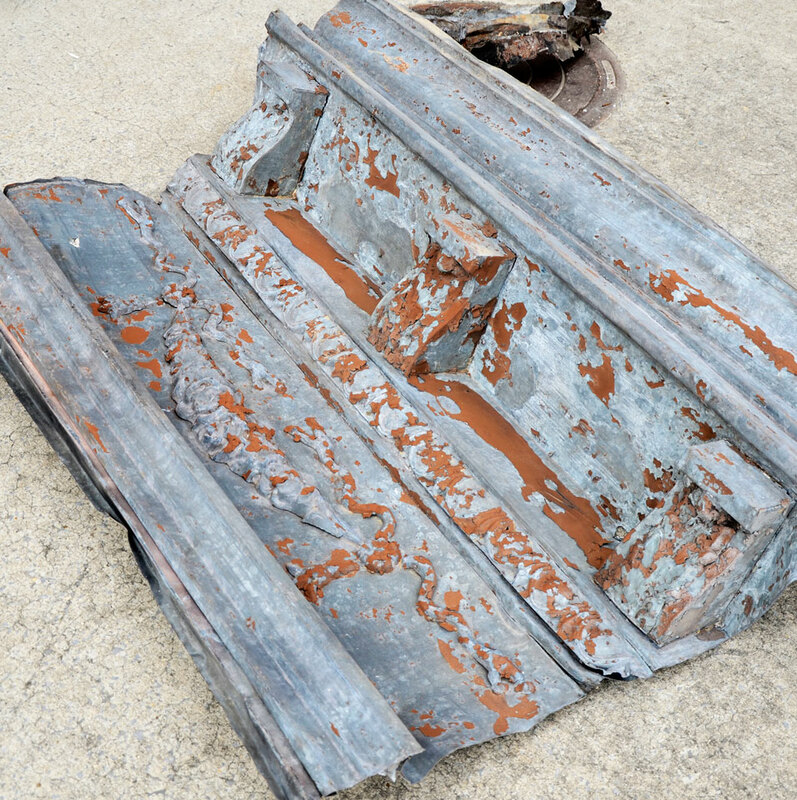 Stop by our showroom or give us a call at 877 737-0554 regarding our inventory of salvaged tin. Custom framing is available through our wood shop. 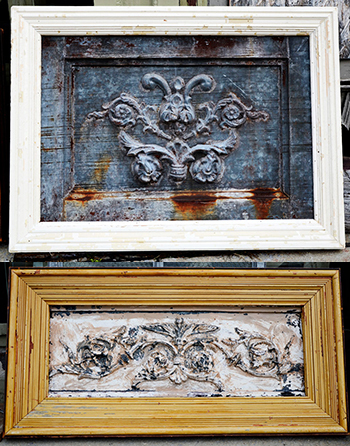 Salvaged tin pieces framed in salvaged door and window trim to create wall art.